I read this article and found it very interesting, thought it might be something for you. The article is called Expressions of support multiply in the final pre-primary stretch and is located at https://votesocialism.com/expressions-of-support-multiply-in-the-final-pre-primary-stretch/. Sunday evening, the campaign got a phone call from a voter in Southwestern Washington. A young woman wanted an explanation of what Steve means by nationalizing banks and the energy industry. With her parents asking questions in the background, she also inquired about Steve’s connections to farmworkers rights and how does he propose to fund the services needed to help people. We had a great discussion and she was thankful, telling me no other candidate had yet answered the phone. With voters guides and ballots out, the campaign is hearing from a lot of voters. Here’s some stories from the last week. • Steve had a marvelous time with supporters in Eastern Washington last weekend. 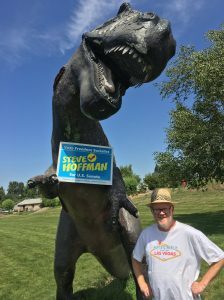 Besides the Cheney Rodeo Day Parade mentioned in last week’s email, Hoffman campaigned in Spokane with volunteers Alice and Muffy and had an interview in Granger at KDNA, La Voz De Campesino. 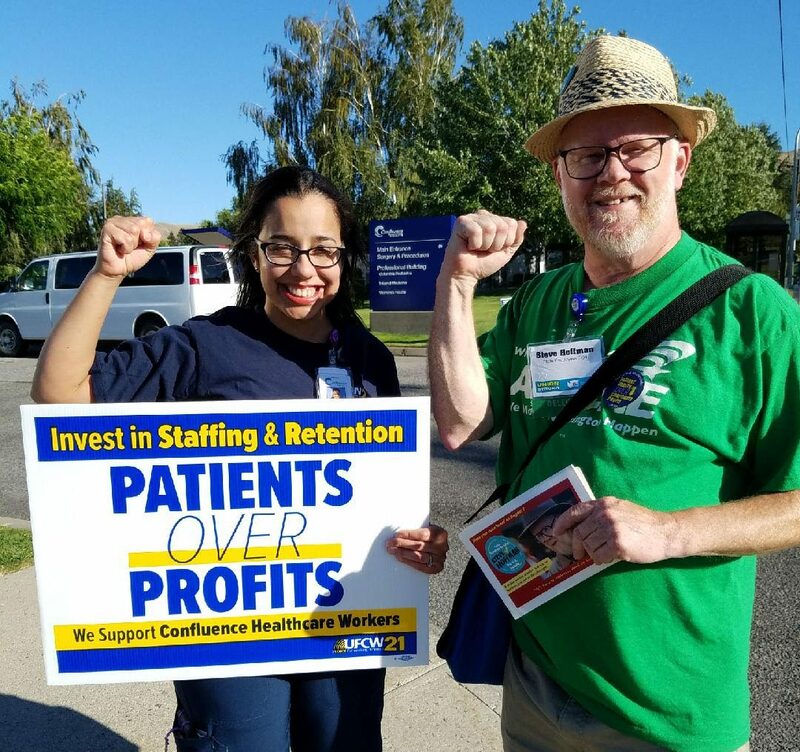 • During the Washington State Labor Council Convention in Wenatchee, Steve and supporter Annaliza attended a picket for hospital workers sponsored by UFCW Local 21 who are in a contract fight with Central Washington Hospital. • Steve had wonderful discussions at two different house parties this weekend. Neighbors at the Friday party asked great questions and shared their points of view. 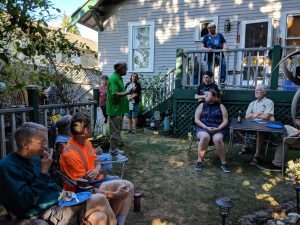 At the Organized Workers for Labor Solidarity BBQ, Steve and attendees tackled questions on how to save our civil rights, health care and labor movement. • The World Labor Hour show interviewed Steve on Saturday morning, July 21st. Listen to the conversation here. 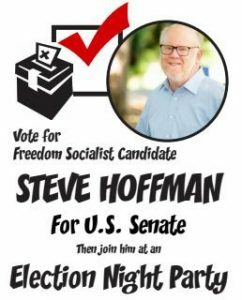 • Supporters Henry and Helen were in their car at a stop sign in the U-District when a young woman approached them and gave them “a thumbs up” for the Steve Hoffman sign in their window. She said she would be voting for Steve. • Another volunteer stapling posters outside a library had a voter thank her warmly for putting them up. He was voting for Steve too. • Facebook and Twitter are lighting up with photos of supporters and the campaign signs on poles and bulletin boards, plus selfies with ballots filled in for Steve. Keep ‘em coming. Email VoteSocialism@gmail.com if you would like an “I voted for Hoffman” sticker and we’ll mail it to you! Voting continues now through Tuesday, August 7th. That evening at 6:30pm the Steve Hoffman campaign is having an Election Night Party here at Headquarters at New Freeway Hall. See the details in the Facebook event. Mark your calendars and help celebrate this wonderful campaign. We are concentrating these last few weeks on handing out the remaining postcards and brochures we have and putting up posters everywhere. Plus calling voters and reminding them to vote for Steve Hoffman! There two just two Volunteer Nights scheduled, July 25th and August 1st. Come down to HQ at 5018 Rainier Ave. S., Seattle, and join the campaign fun! Your contributions are keeping the campaign loud and visible. We are meeting lots of new people with the advertising dollars we’re spending radio and social media. If you haven’t sent a donation in, please consider making one.